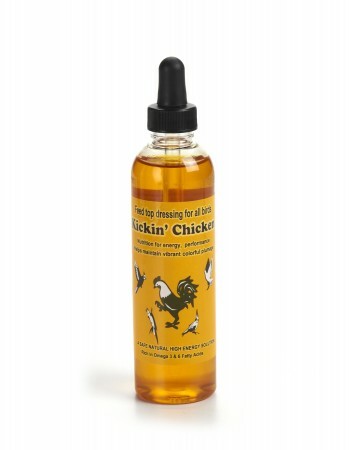 Healthy Coat Kickin' Chicken feed top dressing is a natural and unrefined source of the highest quality Omega 3 & 6 fatty acids and Vitamin E for energy, performance and helps maintain vibrant colorful plumage! 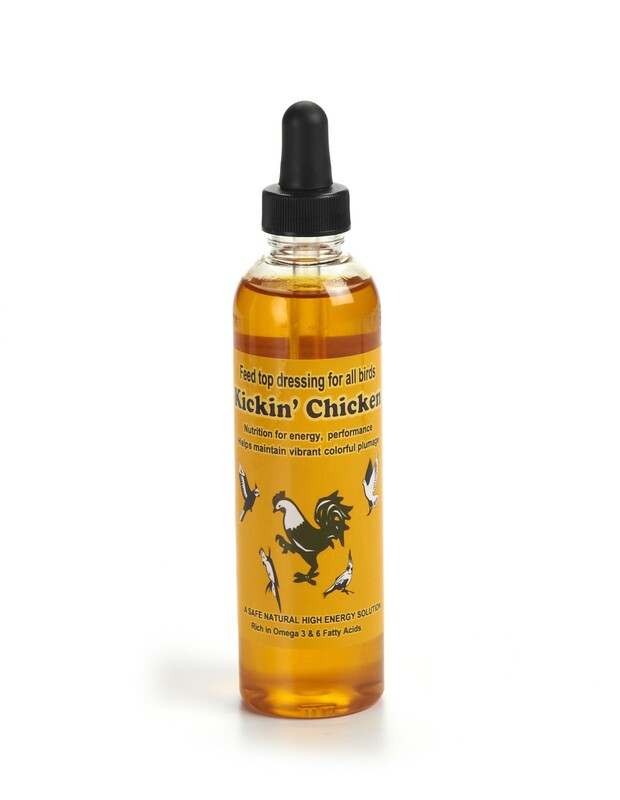 INGREDIENTS: Mechanically extracted Soybean Oil and Flax Seed Oil, Lecithin, Niacin Supplement, Biotin, Vitamin B12 Supplement, Natural and Artificial Apple Flavors and Mixed Tocopherols (Vitamin E as a preservative). GUARANTEED ANALYSIS: Total Fatty Acids/Crude Fat, miniumum 98%, Unsaponifiable Matter, maximum 2.0%, Insoluble Impurities, maximum 1.0%, Free Fatty Acids, maximum 0.50%, Vitamin E, minimum 250 IU/lb., Moisture, maximum 0.50%, Linoleic Acid, minimum (Omega 6 fatty acid) 48%, Linolenic Acid, minimum (Omega 3 fatty acid) 8%. FEEDING INSTRUCTIONS: 2-4 drops per half ounce of seed mixture.